This table delights small and big kids alike. It was a labor of love that spanned at least a year from start to finish but oh so worth it. The table has transformed our living room into a playful and inviting space. My mom gave me these Evil Mad Science panels for my birthday years ago that but the soldering required for 600+ LEDs seemed daunting. 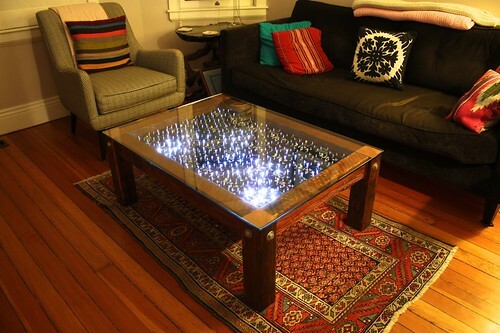 But when our crappy Ikea coffee table wasn’t cutting it anymore, we finally took the plunge. We went to Building REsources and picked out some reclaimed wood full of character and old nails. Nate’s dad had the great idea of taking a wire brush to it to remove the grime while preserving the surface texture. Nate and his dad cut and assembled the table and I worked the soldering iron. I didn’t care for the grid layout of the LEDs so I bent the leads to vary their positions. A couple of polyurethane coats later and voila!